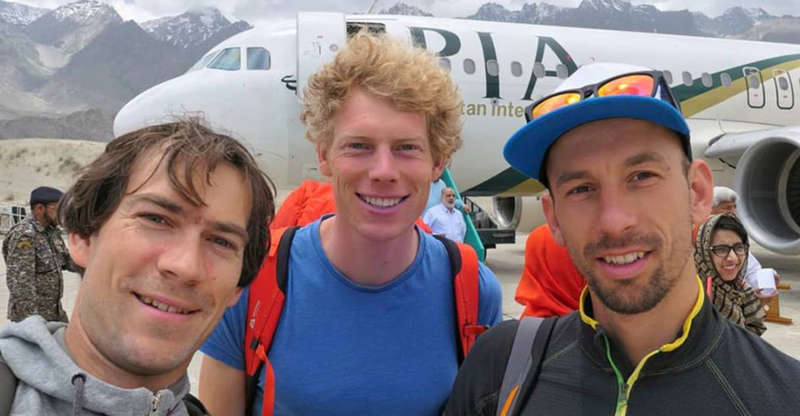 Luka Stražar and Aleš Česen of Slovenia and Tom Livingstone of the U.K have made the first ascent of a new line on the north side of Latok I. The trio climbed three-quarters of the North Ridge before traversing right to the West Col between Latok I and 2. From here, they took the North Face to the summit. 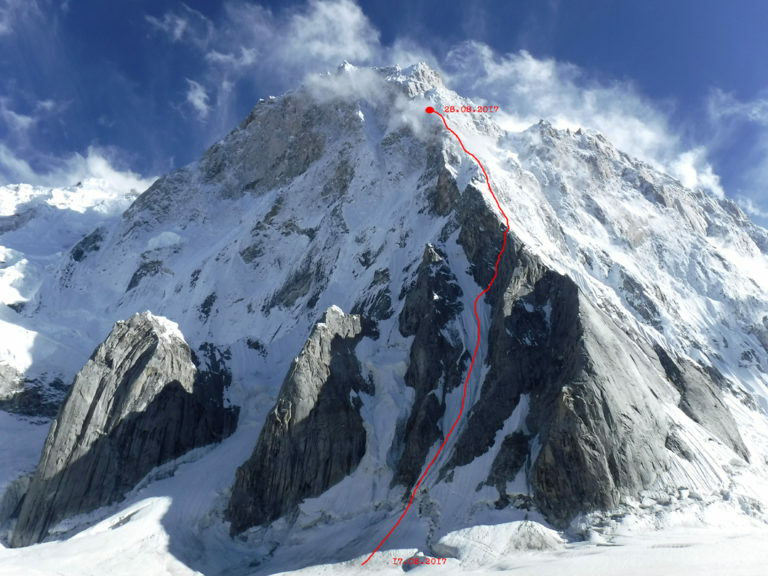 Earlier reports, drawing on ambiguous Google translations of foreign mountaineering sites, incorrectly stated that they had climbed the full North Ridge. 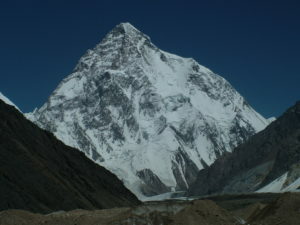 The North Ridge has been widely touted as the last great problem of the Karakorum. Because of the number of failed attempts, it has attained mythical status in mountaineering folklore. Jeff Lowe dubbed it “the unfinished business of the last generation”. 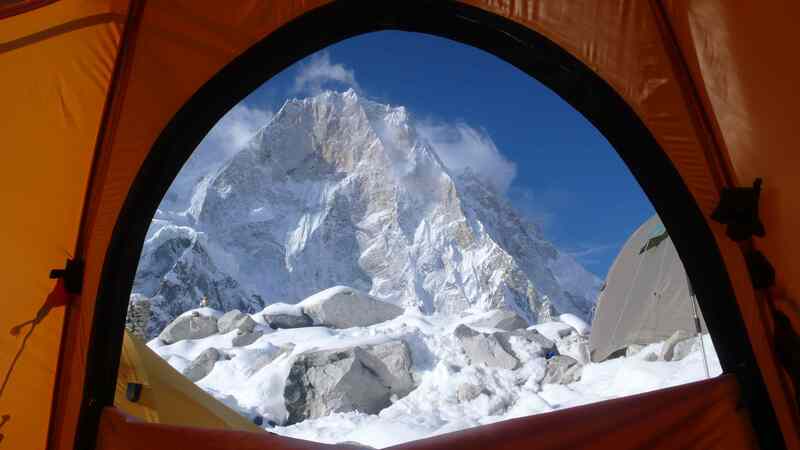 Latok 1 itself has only been climbed once, when a Japanese team summited the south side in 1979. The North Ridge was first attempted in 1978 by the all-American team of Jim Donini, Michael Kennedy, Jeff Lowe and George Lowe. 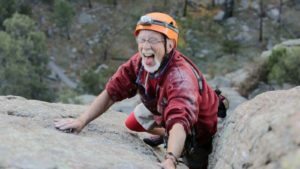 They climbed 100 pitches before sickness and poor weather halted their progress. Since then, over 30 attempts have failed to climb the full North Ridge. Livingstone, Stražar and Česen decided to exit the ridge three-quarters of the way up to avoid dangerous snow mushrooms and cornices on the upper section. They were at roughly the same height where Sergey Glazunov died in a rappelling mishap earlier this season, also on the North Ridge. 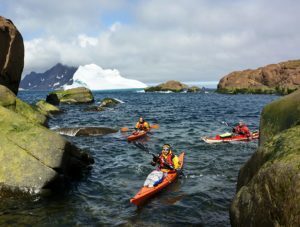 A team which included well known British climbers Doug Scott and Simon Yates aborted their own North Ridge plans back in 1990 due to similarly perilous snow conditions. “This is what I see every day [a photo of Latok I] when I sit down to eat breakfast … It’s one of the most beautiful faces in the world”. 2 Comments on "Breaking News: North Side of Latok I Finally Climbed"
Congratulations on finally climbing the North Ridge! It takes a lot of work and preparation to get to such a huge goal. People look for that kind of motivation in today’s talent pool. So if you ever settle down a bit, consider mentioning the great things you’ve accomplished on your travels!